While the iPad is about the size of a notepad of paper, it can do much more with the written note. Some apps have you taking notes by typing them in, others convert your handwriting to text and still others leave you handwriting the way you wrote it. If there is a need to share notes with a team or a client, most will choose an app that will need to have text entered via typing. There is still a need to be able to scribble notes and drawings. Many of us have hauled Moleskin notebooks around for years to take down our thoughts and personal notes. These are books that we don’t rip pages out of, we can show a page or two to others in person. Generally, these are our personal notes like a diary or out thoughts about an ad outside of a big meeting. An app that has given us that ‘scribbling’ world on the iPad is Penultimate. 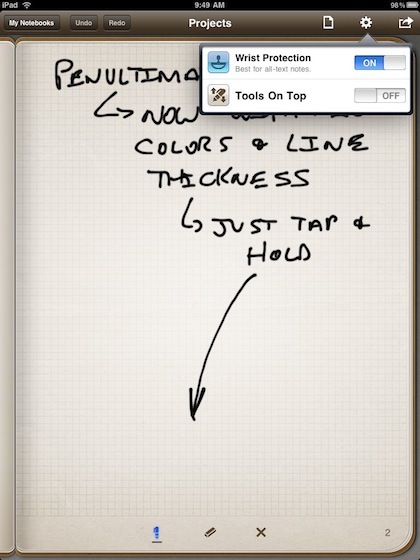 We have mentioned it earlier around how we use it like a mobile napkin for little drawings/notes. Recently, the developers have updated the app with nice usability changes, without taking away the handwritten note feeling we have enjoyed. Unlike the paper based notebooks, we can actually share a page out of our ‘electronic’ paper books. That remains unchanged. The changes to Penultimate are around making the electronic world a bit more like the paper counterparts. The name of your notebooks are now ‘on’ the notebooks instead of along the bottom which has always felt ‘disconnected’. Being able to take multiple notebooks with you everywhere has been nice since the app was first introduced. Due to this feature over real paper has allowed most of us to make more notebooks rather than one that carries the burden of multiple topic streams. New addition in this update is the ability to see a overview grid of all of your notebooks. This view is of the first page of each notebook rather than just the cover. Outside of the normal sharing pages via emailing PDF versions, you can now connect your iPad in a cradle to a external screen and show many folks at a time what your working on. More folks can watch as you input your little scribbles in Penultimate… or lists in your handwriting. No new features around the ability to erase or use the variety of different color pens. An item many of us missed from an earlier update though was the ability to move the pen/eraser/delete buttons to the top of the page. • New grid list view for fast access to many notebooks. Sort by title or by date. • Landscape writing mode that works like turning a notebook on its side! 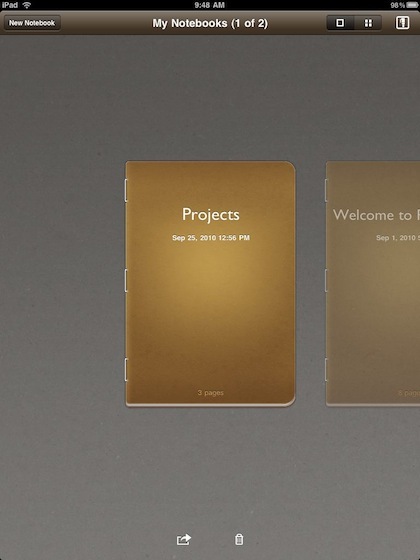 • Improved classic notebook selection screen, with titles right on notebook covers (yes!). • Many fixes for bugs large and small, and usability improvements.